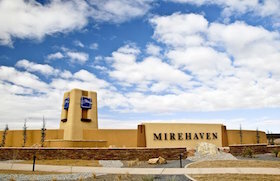 Mirehaven is a new active adult, gated community overlooking the city of Albuquerque, New Mexico, with� views of the Sandia and Manzano Mountains. The Del Webb Community features an amenity center with fitness areas, billiards, kitchen and coffee bar. Outdoors, homeowners will enjoy a swimming pool, bocce, pickleball and tennis courts, along with firepits and an event lawn. Homes are priced from the low $200's to the low $400's with 8 home designs available. Mirehaven is Adjacent to Petroglyph National Monument, and is close to downtown Albuquerque for shopping, medical facilities, and entertainment. Upgrade this listing to include photos, Google Map, Youtube link, and “Contact Us” buttons.